'Oi, oi, oi!!! See me ride out of the sunset - On your color TV screen. Out for all that I can get - If you know what I mean'? Sadly unworthy the Nobel moniker since its hardly TNT? Clearly no dynamite, they certainly won't win the fight, definitely no power load, but you can still watch them explode... or rather implode? The Norwegians can/could still make good music in the new century though. 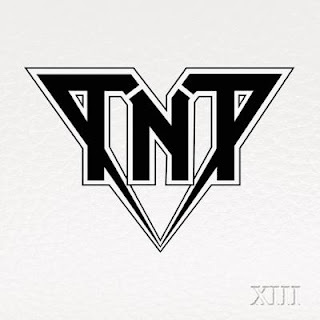 In fact, My Religion is my favorite TNT album... closely followed by Tell No Tales. “XIII” is the bands' thirteenth studio album to date and founding members Ronni Le Tekro (guitar) and Diesel Dahl (drums) are still with us alongside bassist Ove Husemoen and new vocalist Baol Bardot Bulsara (Triple B - Oi! ), who has replaced the once again departed Tony Harnell. The result? Let's just confirm that 13 is not your lucky number, huh? So...it's basically TNT and the terrible, horrible, no good, very bad album? Look what the cat dragged in? Yeah I know it's Poison and not TNT, however, this is kind of icky, sticky and frankly sort of messy, exactly like any poor dead creature which your cat is bringing home infront of your feet(s). It's all down to the material and you'd wish the A&R person could have been more in control, and simply had informed Le Tekro that you need to return with better, stronger, material, prior to recording the album. It's not too loud, too modern or too aggressive. It's simply just a bit dull.